Food is one of the basic needs of life, just like shelter and clothing. Its functional roles include nourishment of the body, providing energy, preventing the onslaught of nutrient - based diseases and also satisfying the psyche by its very nature. During the past few years, an increasing interest in the health aspect of food has been documented. New ways of preparing and using plant material for food have been discovered as also the value of some old practices. 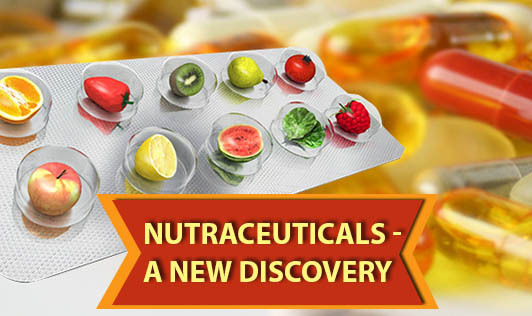 This has led to the coining of a new term called nutraceuticals or health foods for specific use. A functional food / nutraceutical is a food (not a capsule, tablet or powder) derived from natural ingredients; it can and should be consumed as part of daily diet and it has a particular health function when ingested. It serves to regulate particular body processes like. • Enhancement of the body's defense mechanism. • Prevention of disease like hypertension, diabetes and other metabolic disorders. • Control of physical and mental conditions. • Slowing the ageing process. 1. Soya bean contains compounds called isoflavones that act as anti-oxidants and protective agents against degenerative diseases. Soy products available are Tofu-soya bean curd, soy milk and soya granules (healthy nuggets). The low incidence of certain cancers and cardio-vascular diseases in china and Japan might be due to their traditional soy rich diets. 2. Chicory - an additive in coffee is rich in a soluble fiber - inulin (polysaccharide) and thus is beneficial. 3. Oats is yet another high fiber food and has at least three health benefits. It can eliminate or substitute fat, reduce cholesterol in the body and can be used as a slimming food. It is called jav in Hindi or yavulu in Telugu. 4. Yet another lesser known food is flax seed and flax seed oil, which is also a rich source of fiber and essential fatty acids. Try and include these nutraceuticals in your daily diet to see how they can make a difference to your health.